The Great Gatsby is my favorite classic novel. It is also the first classic novel I ever read, in 8th grade. The Robert Redford movie had been released a while before, and I was obsessed with the movie adaptation too. I resisted the 2013 Baz Luhrmann adaptation for a while, but finally rented it and watched this weekend. I was very wary of the movie because of the modern music and CGI involved. To my surprise, this Gatsby was not what I expected. I had two issues with this adaptation. The first was the "Nick in a sanitorium" framework, so different from the novel. I think this framework was unnecessary and detracted from the film. The story is compelling on its own and did not need this artifical device. Second, the fling that Nick and Jordan had was important to the narrative, and this was left completely out of the 2013 film. Nick and Jordan could have met and exchanged pleasantries at a DMV office for all the passion and chemistry they shared. There were some things I really liked about this adaptation, though. I loved the period detail, especially the costuming and the sets. Gatsby's house was spectacular, beginning with the ride in through arched trees. I really liked Leonardo DiCaprio as Gatsby. Robert Redford did a fine job in the 1970's version, but he was a bit too perfect. Even as a young teenager it baffled me that Daisy would choose Bruce Dern over Robert Redford. DiCaprio was more human, more energetic; I believed that he "owned drugstores" and was involved in some mysterious, nefarious activity. His look was right for the part too. I believed that he grew up in a poor family and was a self-made man. I also liked Carey Mulligan as Daisy. Again, I liked Mia Farrow in the original, but she was a very languorous Daisy. Carey Mulligan was younger and more of a flapper. She seemed impulsive as opposed to Farrow's softer and more dream-like Daisy. Other standout performances in this film were Joel Edgerton, who brought Tom Buchanan to life as a vital and brutish man, and Isla Fisher as Myrtle, his mistress. I also liked the Jazz Age energy of this production. I do think the CGI was overdone, and frankly nothing can compete with Nelson Riddle's original 1970's score. (I did not care for the modern music, although it was less jarring than expected.) However, the pace was brisk and suited the 1920's storyline. All said, I would recommend this movie for fans of the novel -- and I would love to hear what you thought of it in the comments section below. I had not seen the original movie and I'm not sure if I read the book in school so I went to watch the movie at the theatre with little expectations other than what the media was saying about it being very 'big,' which indeed it was. I went home and a week later watched the original movie, which I enjoyed, too and it was quite a bit different. Pressed to pick a favorite, I was stumped. 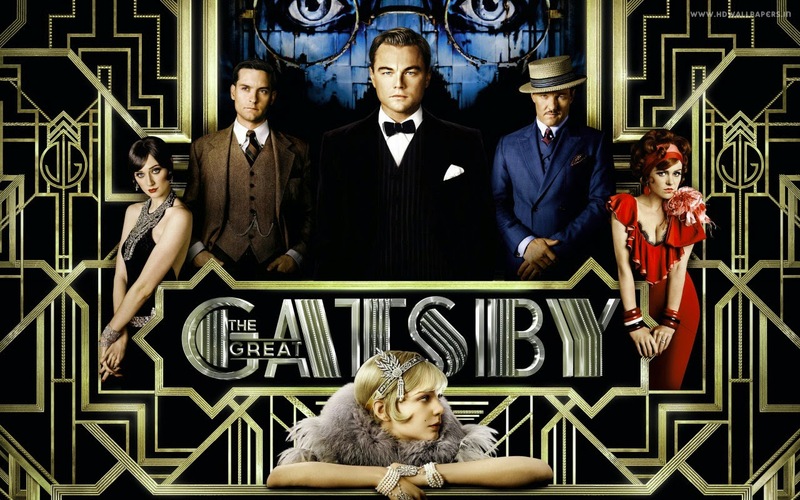 Often with movies like the recent Gatsby that are really ‘large’ on screen a second viewing is required. I don’t often watch a movie twice – because there are so many great movies to see – but this is a case where I might like to see it again to re-evaluate it in my mind. I suppose I could stand to read the book, too.